The only organization of retirees affiliated with the Ohio Education Association and the National Education Association. 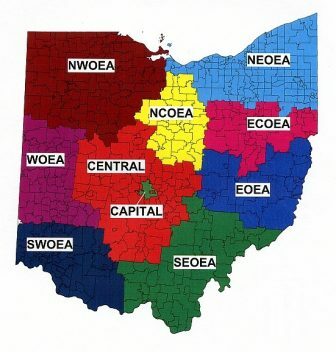 The OEA-Retired will host its annual Spring Conference, April 4, 2019, at the State Teachers Retirement System (STRS) Building, 7th Floor, 275 East Broad Street, in Columbus. Morning speakers include STRS Deputy Executive Director Gary Russell and Ohio Teacher of the Year Jonathon Juravich. Click here for additional details and the registration form. The registration deadline is March 27, 2019. Stay in touch with professional developments and your colleagues, make new friends, and make your retirement dollars go further with membership in OEA-R/NEA-R.
Second row, standing, l-r: Marsh Buckley (NEOEA); Judy Novak (NCOEA); Barbara Catalano, ESP Representative; and Wil Vickery. Last row, standing, l-r: Jane Miller, past OEA-R president (SEOEA); John Hoyes, past OEA-R chair; Mary Binegar (Vice Chair); Phil Long (WOEA); Bonnie Jean Harris, Higher Ed. Representative; Jeff Corbin (Capital); and Barry Alcock (Central). Districts are responsible for the content on their sites. | Not all District’s have additional sites. Responsible for recommending strategies to the OEA Board of Directors that ensure the planning, implementation and assessment of a Collective Bargaining Program that meets the needs of local affiliates. Responsible for efficient operation of OEA Representative Assemblies (RA); credentialing and seating of delegates; establishing the Standing Rules of the RA; and, assisting delegates who wish to address the assembly. Responsible for identifying current issues and trends impacting the human and civil rights of students and members and recommending to the OEA Board of Directors strategies to promote social justice and diversity within the Association and in the larger community. Responsible for screening, evaluating and recommending legislative proposals as well as implementation of legislative priorities, goals and policies as adopted at annual the Fall RA. Responsible for recommending strategies to the OEA Board of Directors that ensure the planning, implementation and regular assessment of a the statewide local development and training program that meets the needs of and strengthens local affiliates. Responsible for recommending to the OEA Board of Directors strategies that ensure the planning, implementation and regular assessment of an internal and external organizing program that meets the needs of local affiliates. Responsible for recommending strategies to the OEA Board of Directors that ensure the planning, implementation and regular assessment of the professional development program that promotes the OEA’s legislative agenda and meets the needs of locals and supports the professional growth of members.